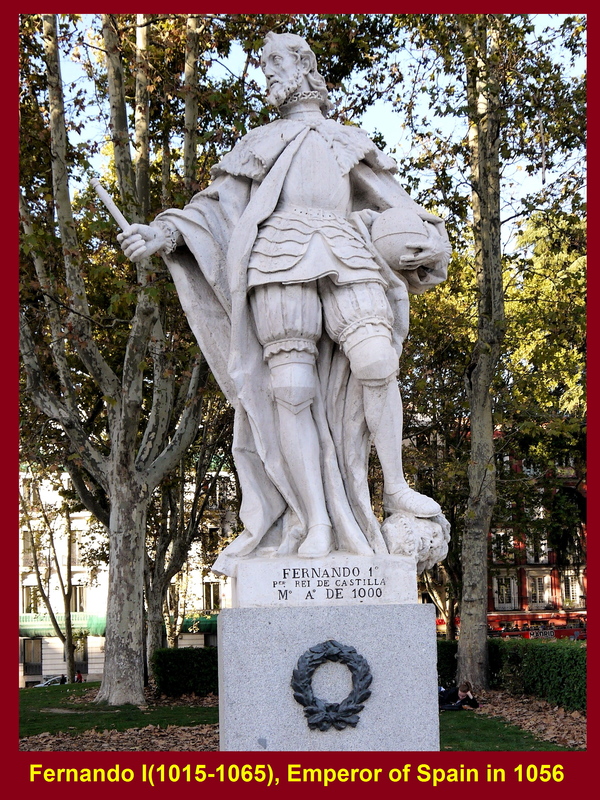 On this day, we were going to Madrid, the capital of Spain, in the afternoon, after visiting Toledo in the morning. 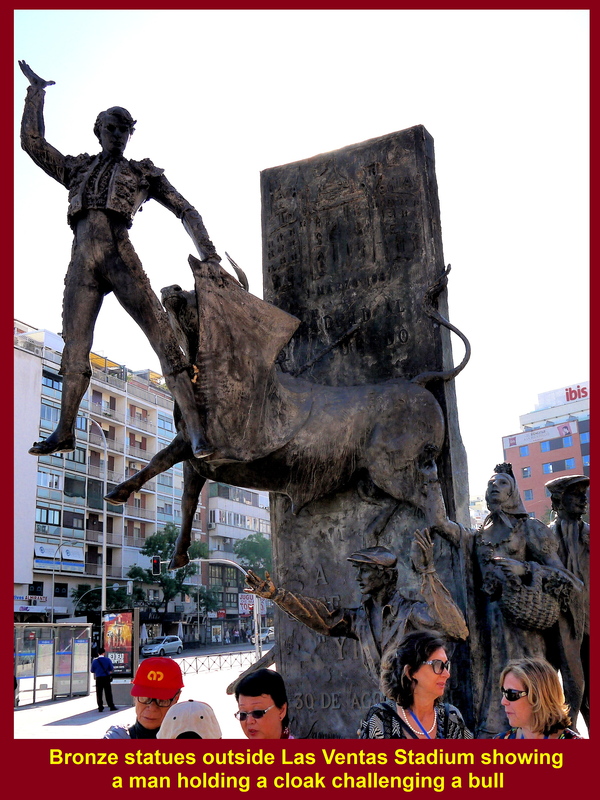 After lunch in Toledo, we travelled 73 km north-east to Madrid for an hour. 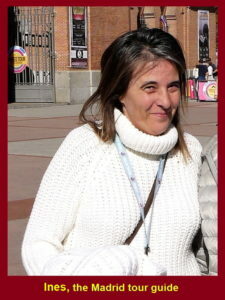 Arriving at Madrid, we met a Madrid tour guide, Ines, who brought us round. 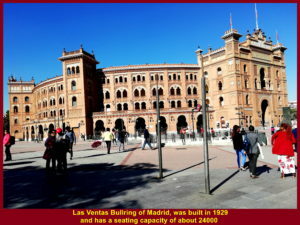 The first place we visited in the city was a large bullring, Las Ventas, that has a seating capacity of about 24000 and opened for bullfighting in 1931. 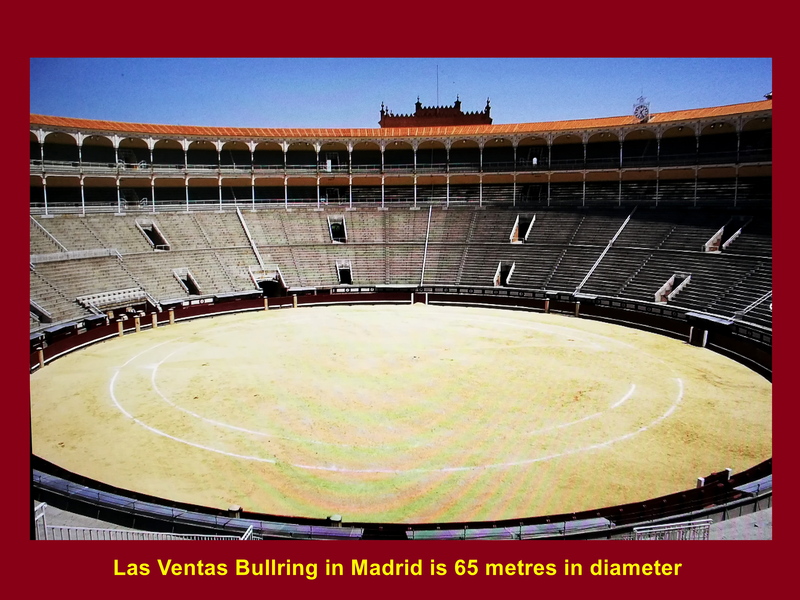 It is also used for concerts, tennis competitions, cultural celebrations and other activities. 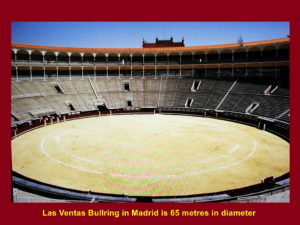 Diameter of Las Ventas Bullring is 65 metres and its seating capacity is 24000. 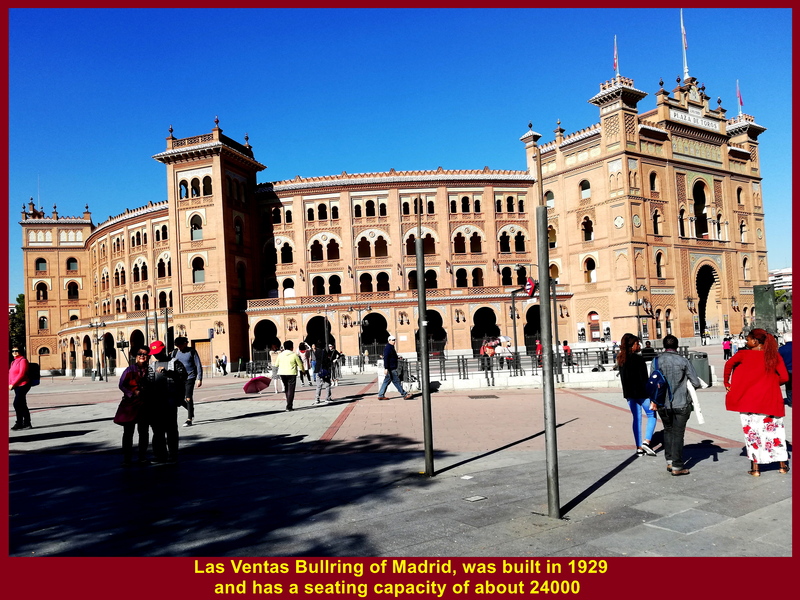 On the way to the Royal Palace of Spain from the bullring, we passed by a large football stadium that is known as Santiago Bernabeu which was opened in 1947 and has a seating capacity of about 81000. 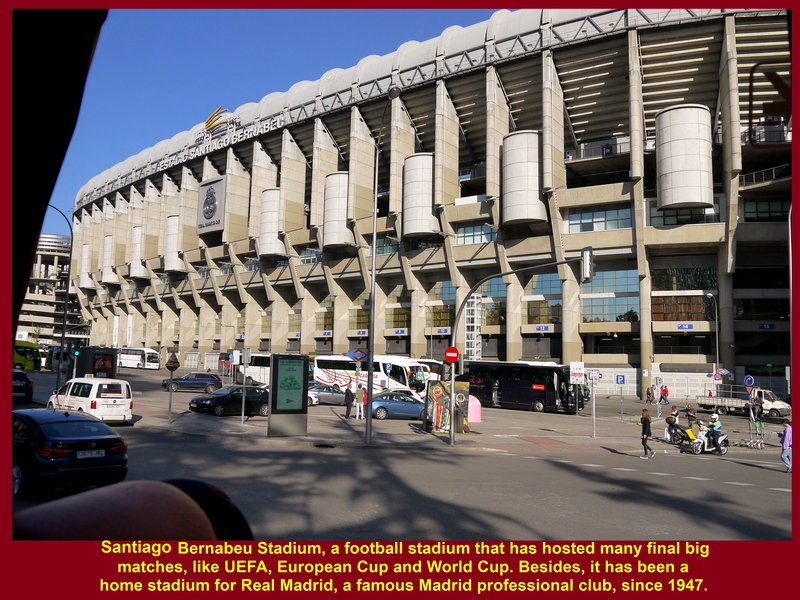 Many grand final matches, such as European Cup, UEFA and World Cup, have been played in the stadium. 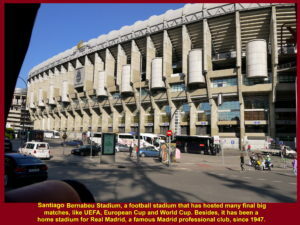 Besides, it is a home to Real Madrid Football Club, a famous professional football club since 1947. 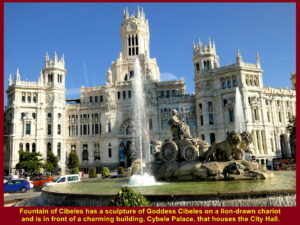 Then we passed by a stunning, white building called Cybele Palace. 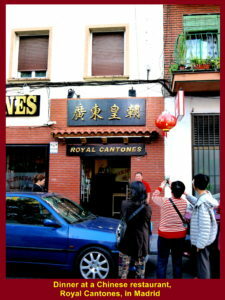 It was opened in 1919 until 2007 as headquarters for postal and communications services. 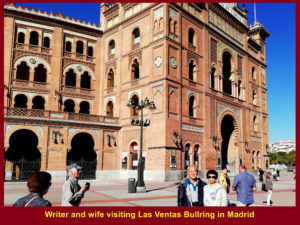 Now it houses Madrid City Hall and a cultural centre known as CentroCentro. In front of Cybele Palace is a roundabout that has a beautiful fountain in its centre. 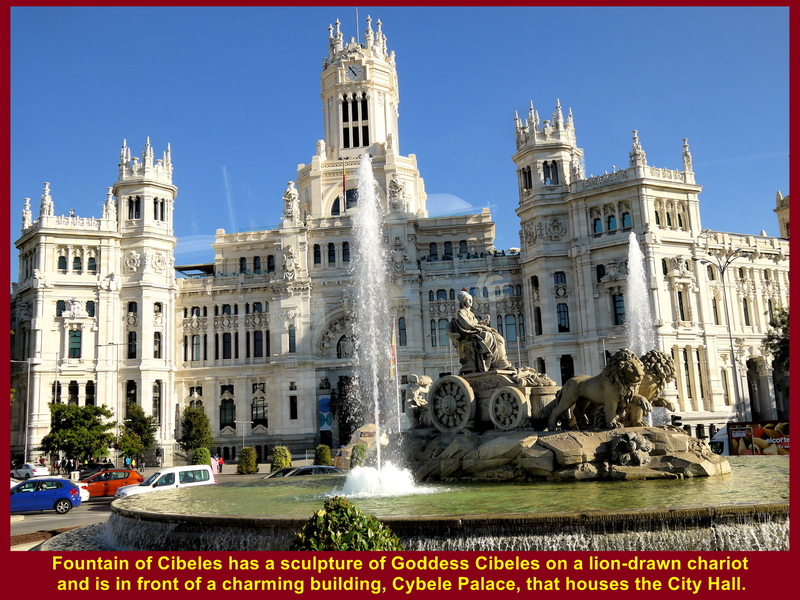 It has a sculpture of a Phrygian goddess, Cibeles. riding a lion-drawn chariot. 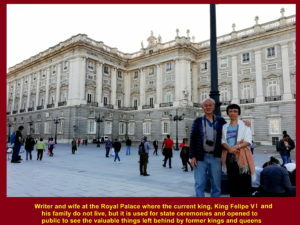 Later, we arrived at the Royal Palace of Spain. It is a grand palace where the current king, King Felipe VI and his family do not live. 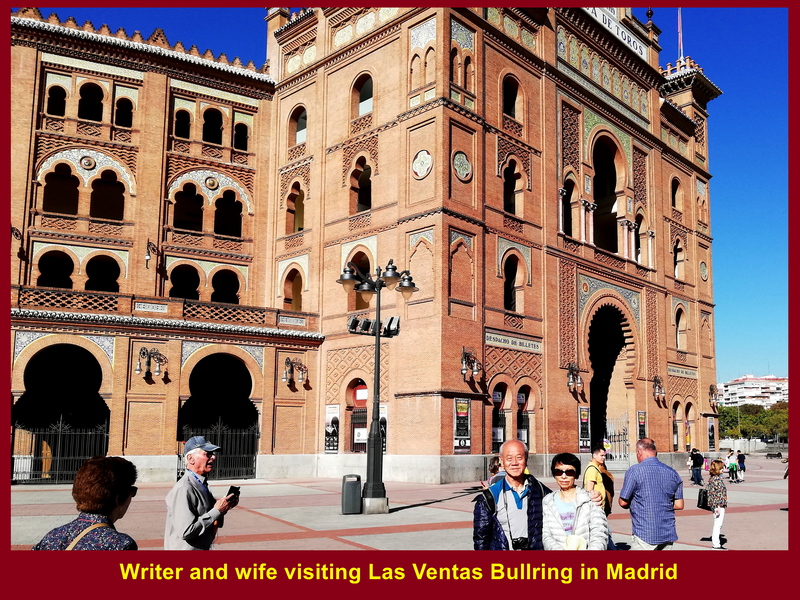 It is used for state ceremonies and opened to public for them to see the valuable things left behind by former kings and queens of Spain. 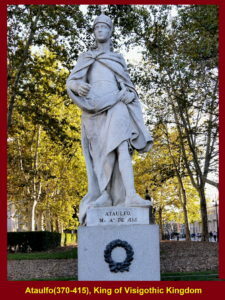 In a square, Spain Square, near the royal palace, there is a monument in memory of Miguel de Cervantes(1547-1616), a famous Spanish writer. 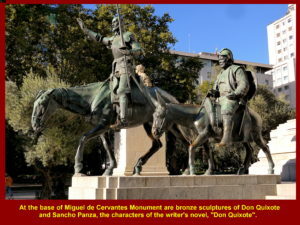 “Don Quixote” is one of his novels. 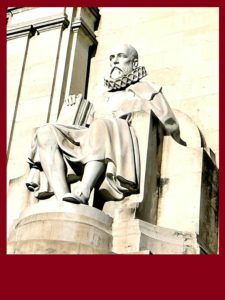 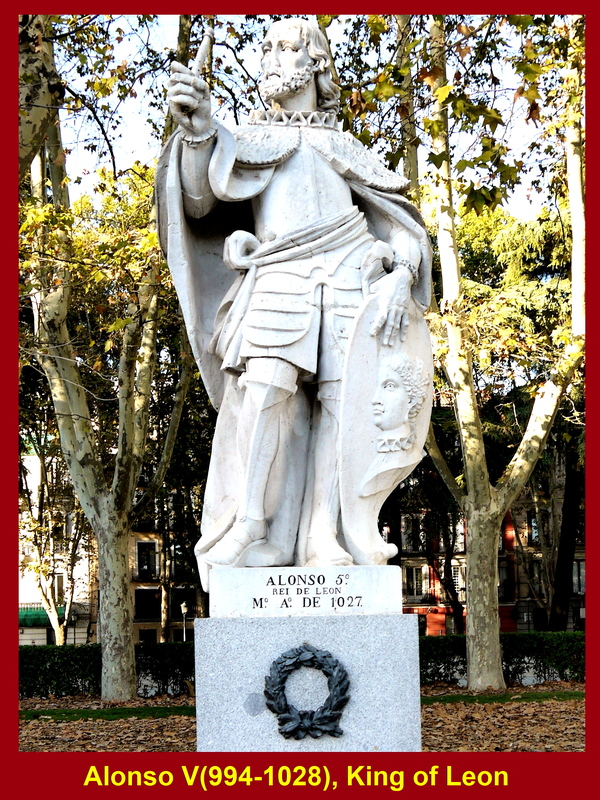 The story of “Don Quixote” is about a nobleman, Alonso Quixano. He knows so many romances of chivalry that he loses his mind and becomes a knight-errant trying to revive and serve his country under the name Don Quixote de la Mancha. Knight-errant is a medieval knight who travels around doing brave things and helping people in trouble. 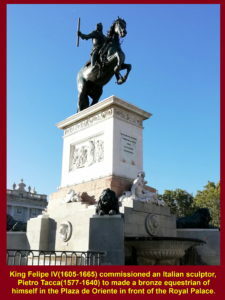 In another square near the royal palace, Oriental Square, there is a bronze equestrian of King Felipe IV of Spain(1605-1665). 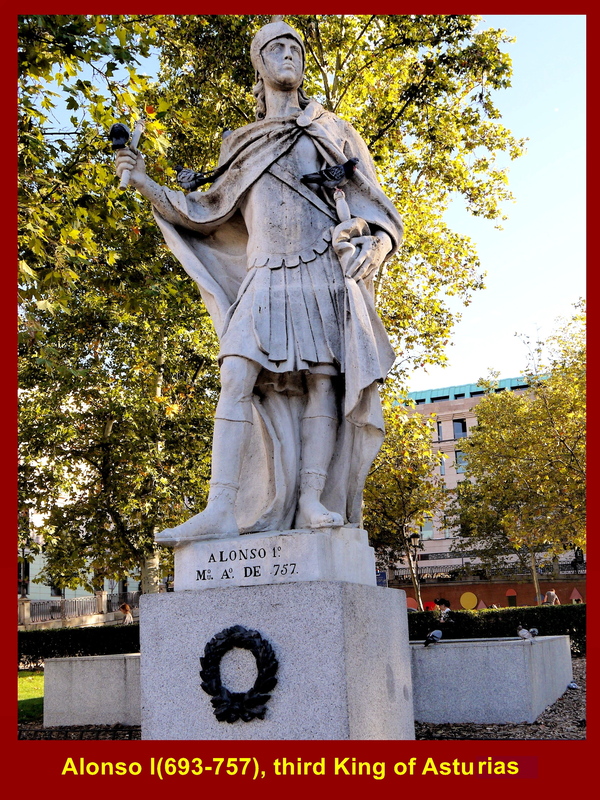 He ruled Spain from 1621 till 1665. 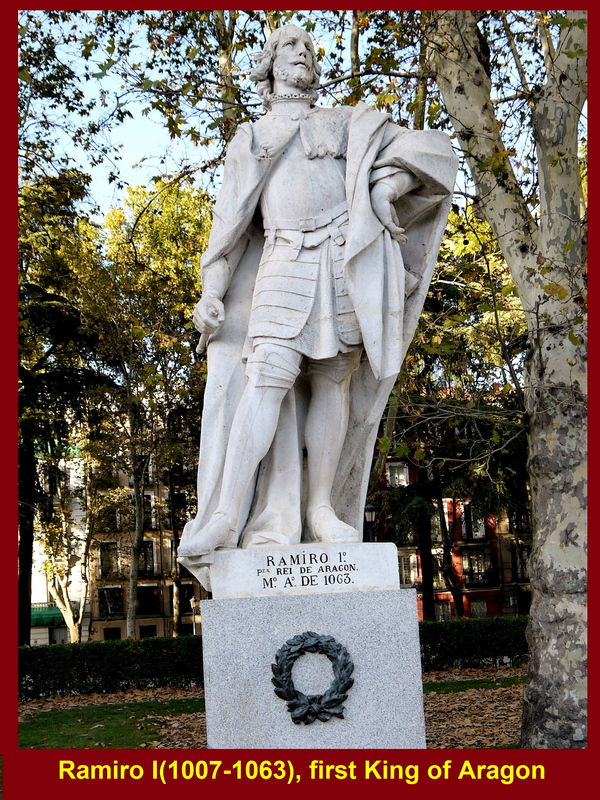 The king commissioned an Italian sculptor, Pietro Tacca(1577-1640), to made this equestrian of himself. 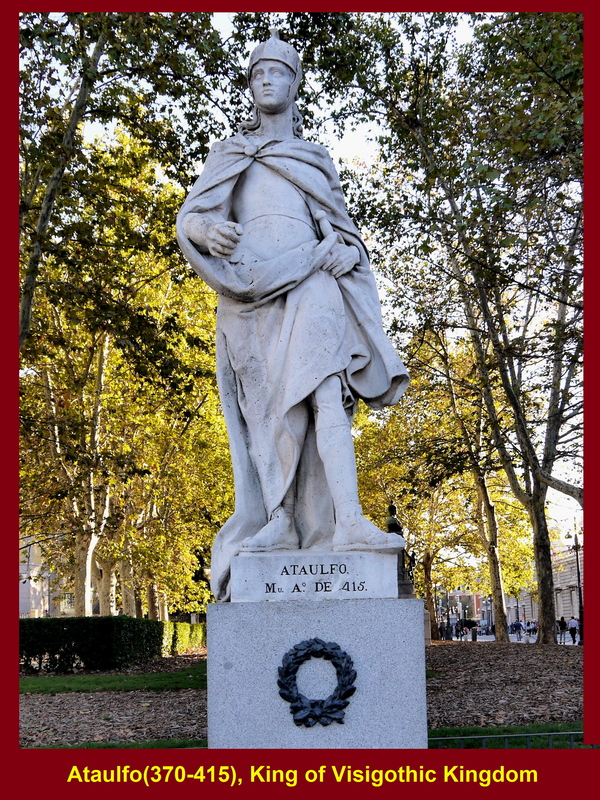 Located near the Oriental Square is the Sabatini Garden. 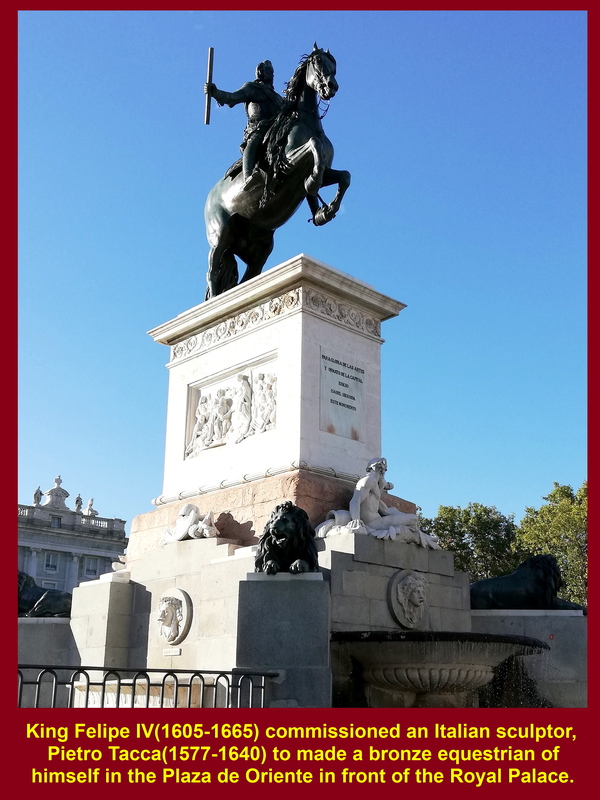 It was opened by King Juan Carlos I(1938- ) in 1978 in honour of an Italian architect, Francesco Sabatini(1722-1797), who had made a lot of contributions to the architectural landscape of Spain in the 18th. Century. 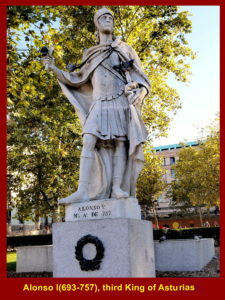 King Juan Carlos I ruled Spain from 1975 until his abdication in 2014. 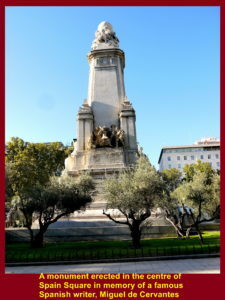 The photo below shows the main gate into the city of Madrid, Puerta de Alcala, in the Plaza de la Independencia. It was built in 1778 and looks like a triumphal arch that is one of Sabatini’s works. 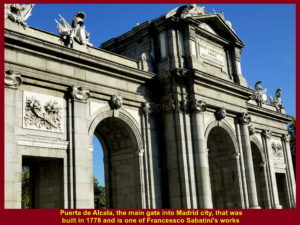 Puerta Alcala was built in 1778 as the main gate into Madrid city and is one of Francessco Sabatini’s works. 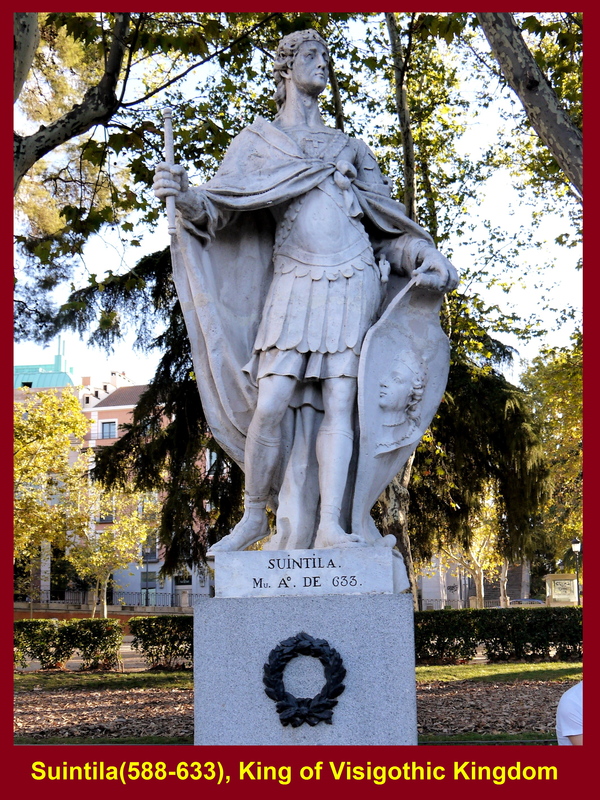 In the shady garden of Sabatini Garden near the Royal Palace there are about 20 statues of Spanish kings arranged in two rows, including King of Visigothic Kingdom, Ataulfo(370-415), King of Visigothic Kingdom, Suntila(588-633), King of Asturias, Alonso I(693-757), King of Leon, Alonso V(994-1028), King of Aragon, Ramiro I(1007-1063) and Emperor of Spain, Fernando(1015-1065), as shown in the photos below. 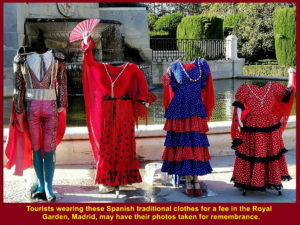 Near the Monument to Miguel de Cervantes, I saw four colourful Spanish traditional clothes. 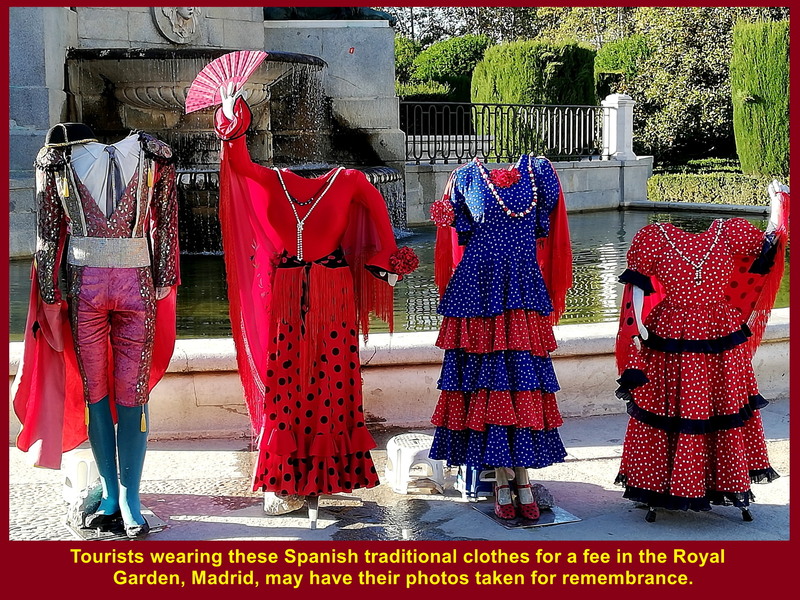 They were meant for tourists who wanted to be photographed in them for remembrance, but they had to pay a fee to the owner. 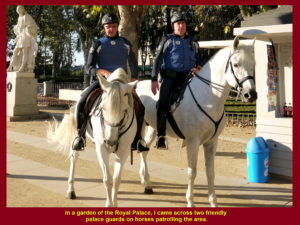 In a Royal Palace garden, I came across two palace guards on horses patrolling the palace area. 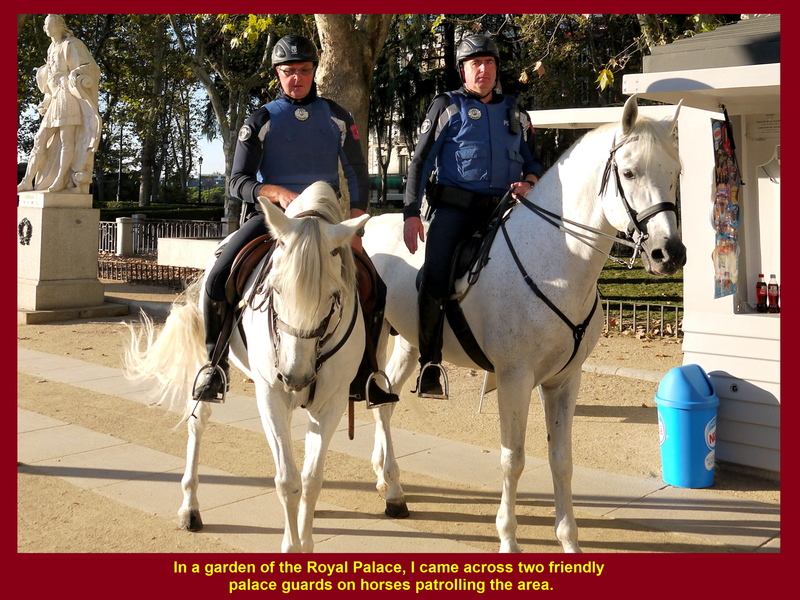 They were very friendly and allowed me to take a photo of them. 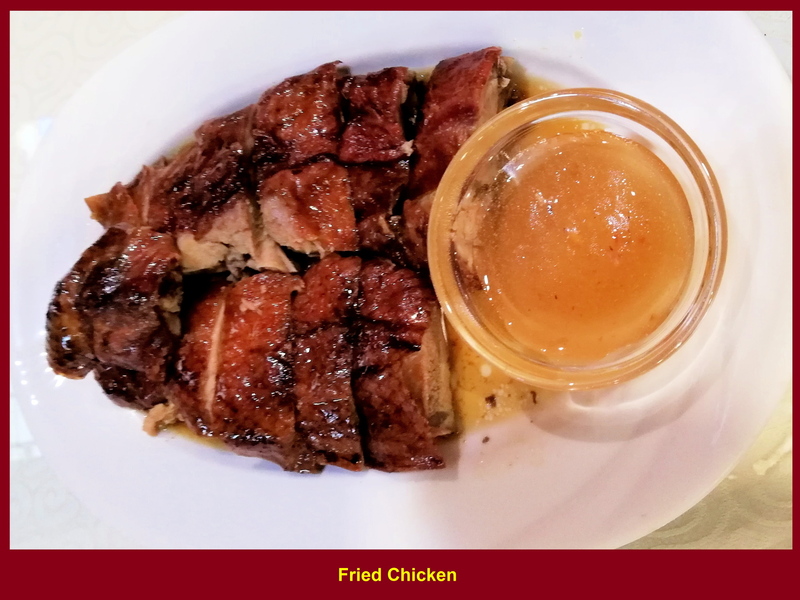 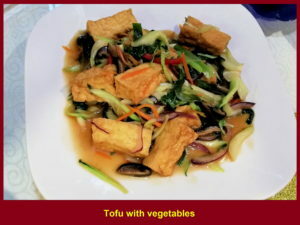 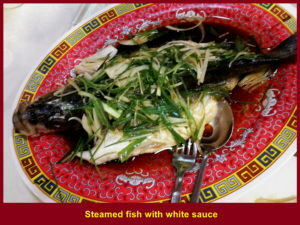 Soon we left the Royal Palace in Madrid and went to a Chinese restaurant, Royal Cantones Restaurant, for dinner in the city. After dinner we travelled back to Hotel Puerta de Segovia in Segovia which is 90 km north-east of Madrid. 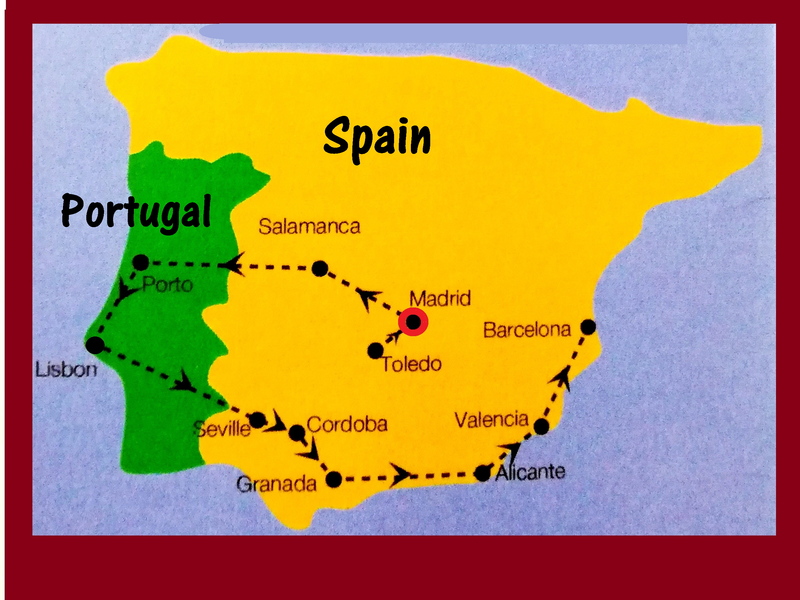 Our next destination would be Salamanca on the following day, Thurs, 24 October 2018.